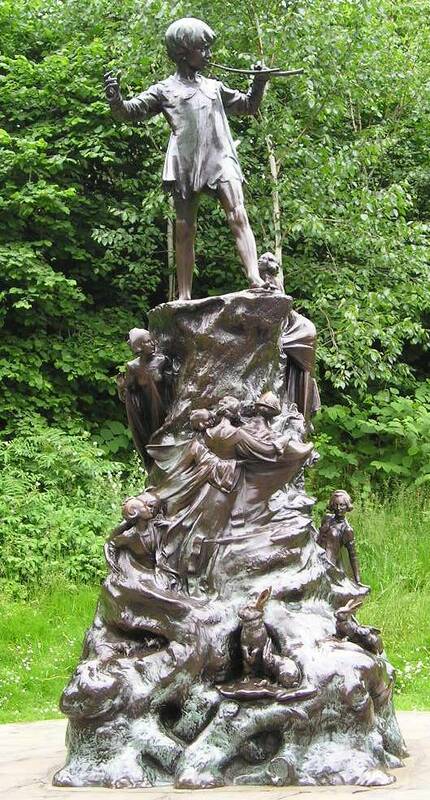 The Peter Pan bronze sculpture in Kensington Gardens is one of the most popular statues across London. It was erected by sculptor Sir George Frampton in the year 1912, following an original commission by J. M. Barrie himself, creator of the fictional character. Peter Pan first appeared in stories which Barrie told to the sons of his friend, Sylvia Llewelyn Davies, with whom he had a special relationship. It then appeared in print in The Little White Bird (1902), a fictionalised version of Barrie’s relationship with the Llewelyn Davies children. In fact, the spot chosen for Frampton’s sculpture, is the very spot where Peter Pan lands in Barrie’s story. In the story, the boy flies out of his nursery and lands beside the Long Water lake – on the spot where the statue actually stands (in a leafy glade about half way along the west bank of the Long Water). Barrie began thinking about a Peter Pan statue in 1906. He took a series of photographs of the six-year-old Michael Llewelyn Davies wearing a special Peter Pan costume. This was Barrie's ideal vision of Peter Pan that he planned to give to a prospective sculptor. Six years later, in 1912, Barrie paid Sir George Frampton to create the statue. "There is a surprise in store for the children who go to Kensington Gardens to feed the ducks in the Serpentine this morning. Down by the little bay on the south-western side of the tail of the Serpentine they will find a May-day gift by Mr J.M. Barrie, a figure of Peter Pan blowing his pipe on the stump of a tree, with fairies and mice and squirrels all around. It is the work of Sir George Frampton, and the bronze figure of the boy who would never grow up is delightfully conceived." 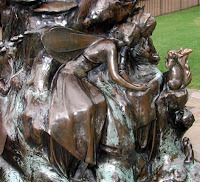 The statue features Peter Pan standing on a tree stump playing a flute (supposedly a set of pan pipes) whilst a collection of fairies, rabbits, squirrels and other little creatures adorn the base. The main fairy is believed to be Tinker Bell reaching towards the boy. Curiously enough, Frampton described his work as follows: "The animals and fairies on the statue are listening to the Pipes of Pan, one of the mice is completing his toilet before going up to listen to the music, and the squirrel is discussing political matters with two of the fairies." Despite the words in the announcement, Barrie was not completely satisfied with Frampton's work. 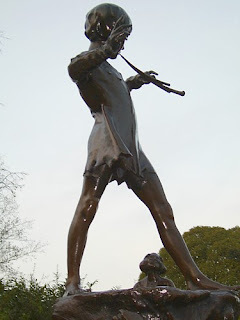 The sculptor had not modelled Peter Pan on Michael Llewellyn Davies as Barrie had intended, but instead, had used another boy, possibly James W. Shaw or William A. Harwood. Barrie said of the statue: "It doesn't show the Devil in Peter." Other people were not happy with it either. Questions were asked in the House of Commons about whether an author should be permitted to promote his own work by raising a statue of one of his characters in a public park. However, visitors to the gardens loved the statue. Barrie and Frampton had hoped it would give "quiet pleasure to nannies and their young charges as they walked passed and played in the Park." The sculpture quickly achieved iconic status and soon all images of Peter Pan looked like the Kensington Gardens version. Copies were made from Frampton’s mould and there are now Peter Pan statues in Egmont Park in Brussels (1924); Bowring Park in St. John’s (Newfoundland, Canada, 1925); Queen’s Gardens in Perth (Australia, 1927); Liverpool (1928; originally in Sefton Park, but now in storage due to vandalising); Glenn Gould Park in Toronto (Canada, 1929); and in Rutgers University in Camden (New Jersey, USA). 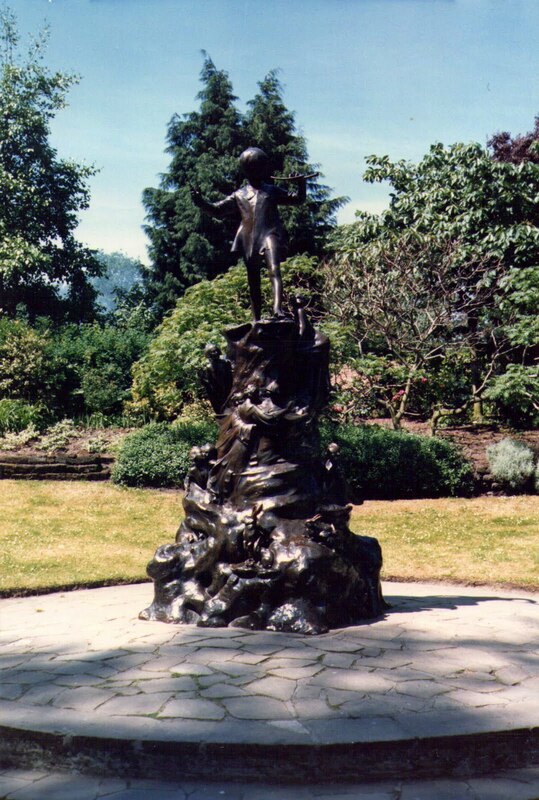 I first came to know the Peter Pan statue when I watched Steven Spielberg’s Hook (1991), several years ago, maybe when I was about six years old. I have watched the movie several other times throughout my life, and every single time that I have, I have experienced a growing interest on the statue, that appears close to the end of the motion picture. However, I have not been able to find out whether or not the scene was actually shot at Kensington Gardens or not, with the original sculpture featuring in the film. In any case, I definitely look forward to visiting it when I finally travel to London. Here is a photograph taken by my father in May 1987. I could have been there too, since I was already born, but in any case, I was rather too small, either to look at the statue ‘properly’ as I would today, or simply to remember the experience! I love Peter Pan character too! I didn't know about Peter Pan statue :s but I've found it quite interesting! I hope visit London soon too and visit the statue now that I know about it! By the way, have you seen 'Finding Neverland'? I think it's a nice way to represent author's life and Peter Pan's story at the same time.